LG likes to keep a large, rolling selection of mid-range and low-end phones available for a variety of customers, and today it's revealing two more. The K8 LTE and K5 are both 5-inch phones with a focus on style over substance thanks to somewhat low specifications, but they should do well enough if they're launched at the right price. Unfortunately the press release doesn't say how much the phones will cost, but the K8 will sell in Asia, the Middle East, Africa, Latin America, and Russia, while the K5 will be limited to Europe, Russia, and Latin America. Both should be available to purchase later this week in some markets. The K8 offers a 5-inch LCD "HD" screen, which probably means 720p resolution. LG is quick to mention its curved "Arc glass" screen, which has been seen on a few other models. The cameras are decent with an 8MP shooter on the rear and a 5MP "selfie" cam on the front. Otherwise specs are middling at best, with a 1.3GHz quad-core processor of unknown origin, just 1GB of RAM on the Latin American version and 1.5GB elsewhere, a 2125mAh removable battery, and an unknown amount of storage with a MicroSD card expansion slot. The phone will run Android 6.0 underneath LG's skin, and it's set to sell in gold, indigo, and white colors. The K5 has the same 5-inch screen size, but its resolution is bumped down to just 854x480 with no swanky curved glass. It does get a metallic body, but inside is the same 1.3GHz processor, a single gigabyte of RAM and 8GB of storage plus a MicroSD card slot, and a 5MP/2MP camera setup. The battery is even smaller at 1900mAh, though it is removable, and users will have to make do with Lollipop 5.1 for software. The K5 will sell in gold, silver, and "Titan" colors. 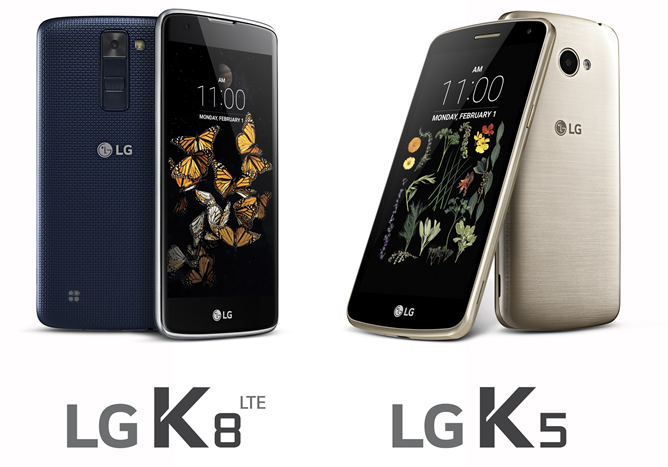 LG doesn't say which wireless bands are supported on the K8 LTE and the K5, but the omission of "LTE" from the latter might mean it's a 3G-only device. Hopefully the price reflects its lack of capability.